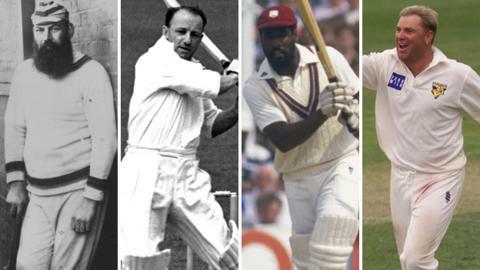 Wisden has named four Englishmen in an all-time Test World XI to mark 150 years of the Cricketers' Almanack. Openers Jack Hobbs and WG Grace are included, along with wicketkeeper Alan Knott and fast bowler Sydney Barnes. The team is captained by legendary Australia batsman Don Bradman and features his countryman Shane Warne. West Indians Viv Richards, Garry Sobers and Malcolm Marshall all make the XI along with India's Sachin Tendulkar and Wasim Akram of Pakistan.